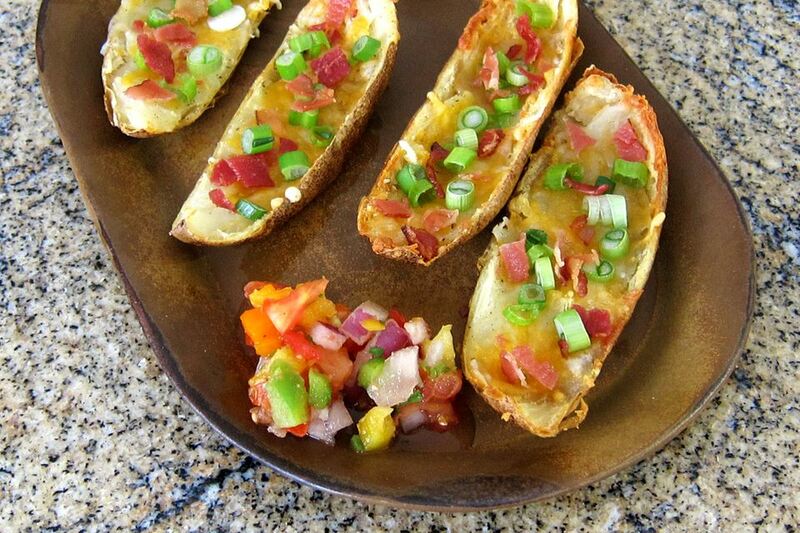 These baked potato skins include a combination of shredded cheese, bacon, and green onions. The potato skins are a delicious snack, and they're always a hit. They're baked, so they need very little hands-on cooking time, and you don't have to worry about cooking in batches. Another plus, they're lighter than deep-fried potato skins. Bake them and serve them as a snack for a family movie night or scale the recipe up for a large group or party. Or serve them with a big breakfast; they're an excellent alternative to home fries or hash brown potatoes. You can vary the toppings for these tasty potato skins with your family's favorite ingredients. Consider using pizza toppings, like mini pepperoni, sliced olives, and mozzarella cheese or a pizza blend. Or add some browned ground beef for bacon cheeseburger potato skins. Sliced sauteed mushrooms make a tasty topping as well, and diced ham is a good substitute for the bacon. Serve the potato skins with a dollop of sour cream, Greek yogurt, or guacamole, or serve them with homemade or commercial tomato salsa, corn salsa or ranch dressing. Heat the oven to 400 F. Scrub the potatoes and prick several times with a skewer or fork tines. Bake the potatoes for about 1 hour to 1 hour and 15 minutes, or until the potatoes are fork-tender. When the potatoes are cool enough to handle, cut them in half lengthwise. Scoop out much of the potato from each half, leaving about 1/4 to 1/2 inch of potato in the shell. Save the potato for another use, such as baked potato soup or mashed potatoes. Cut the halves in half again lengthwise. Brush all over with olive oil or vegetable oil, then sprinkle the tops with salt and pepper. Arrange on a baking sheet and bake for 10 minutes, until slightly crisp around the edges. Remove the potato skins from the oven and mound about 1 tablespoon of shredded cheese on each piece; sprinkle with crumbled bacon. Return the potato skins to the oven and bake for another 7 to 10 minutes, or until the cheese has melted. Top with thinly sliced green onion. If desired, serve with small bowls of salsa, guacamole, and sour cream. Use leftover potatoes in meatloaf, to top a casserole, or make potato pancakes with them.